Pages: Difficult to say, because the numbering is disorderly and unreliable, but the web address count is 921. Spoiler-free Synopsis: A pragmatic, good-hearted wombat engineer gets wrapped up in a quest involving dead pagan gods, talking statues, vampiric squash, the social politics of an anthropomorphic hyena tribe, a possibly-demonic shadowchild who wants to be good, an oracular slug with an attitude, a shrew pirate-troll-awesomething with even more attitude, mythologies so tangled even the god Ganesh has trouble working them out, and far too much magic for her comfort. All Digger really wants is to stop being lost and go home. Reason for Beginning: Ursula Vernon has been known on deviantArt and Elfwood for her oddball drawings and clever, slightly-insane explanations for them. I like her creative weirdness, and her sense of humor, and wanted to see if it would hold out over a longer story. Reason for Finishing: It did. And fortunately, the central characters are all very interesting, mostly likable folks, and the mythology Vernon creates is intriguing. Story Re-readability: While the overarching plot might only beg for one or two rereads at most, to catch all the details, individual pages and passages make for fun and satisfying rereads on their own, on account of Vernon filling every nook and cranny with something uniquely funny, touching, ominous, and/or character-building. Author Re-readability: Definitely. She knows how to keep the characters and setting interesting even when not much appears to be happening plotwise. Artist Re-viewability: Her main weakness seems to be drawing human faces; they often don’t succeed in communicating the characters’ age or even expressions very well. Fortunately, most of the characters are non-human, which she manages much better. The stark black-and-white art at times causes problems when she’s drawing particularly complicated objects or an odd perspective, because with all the lines and shadows it can be hard to make out the details, but on the whole it creates a heavy, ominous atmosphere. Vernon’s real specialty, though, is creating weird new creature designs, often of a goofy variety, and then giving them a certain dignity; check out her fierce hyena tribes, bridge trolls, and oracular slugs below. There are many memorable, even iconic, images in this strip. Recommendation: Aye! It has an effective mix of pathos, comedy, and mystery. Digger herself (yes, the wombat is female) is one of the more original and likable webcomic protagonists I’ve met, and you get to know her very well. Where the story becomes more interesting than just a fantasy adventure is when it throws in some surprisingly difficult moral quandaries that challenge Digger and engender some thoughtful discussions among the characters, as well as, hopefully, the readers. The thing is, I’m a wombat. And no self-respecting wombat has anything to do with magic. It’s dangerous, but mostly it’s just bad taste. This is a peculiar twist on the idea of the fantasy quest, but an entertaining one. If you read mainly for the plot, you might get frustrated, because it takes some time to get going. For the most part, and despite heavily featuring prophecies and divine intervention, the plot of Digger reveals itself naturally in small stages, like one of the dark underground caverns through which our heroine often walks with her lantern held high and her sensitive nose sniffing the dusty air. It takes quite awhile for the main quest to get moving, but honestly, I didn’t miss it. The build-up is every bit as entertaining and fascinating as the climax – perhaps even moreso, in fact. The naming of Ganesh, a Hindu deity, would seem to set this story in India, yet the designs of the humans look either more oriental or, in the case of the village nurse or a local ruffian, very Caucasian. I don’t know if this is due to Vernon’s afore-mentioned difficulty with drawing humans, to laxity of design, or to deliberate artistic choice, but it does work to make the setting rather vague. In the long run, this probably helps the story, as it has enough exoticism to feel different from standard Western fantasy while still retaining a certain timeless quality. Sort of timeless. I mean, this is still a pre-industrial society we’re talking about. 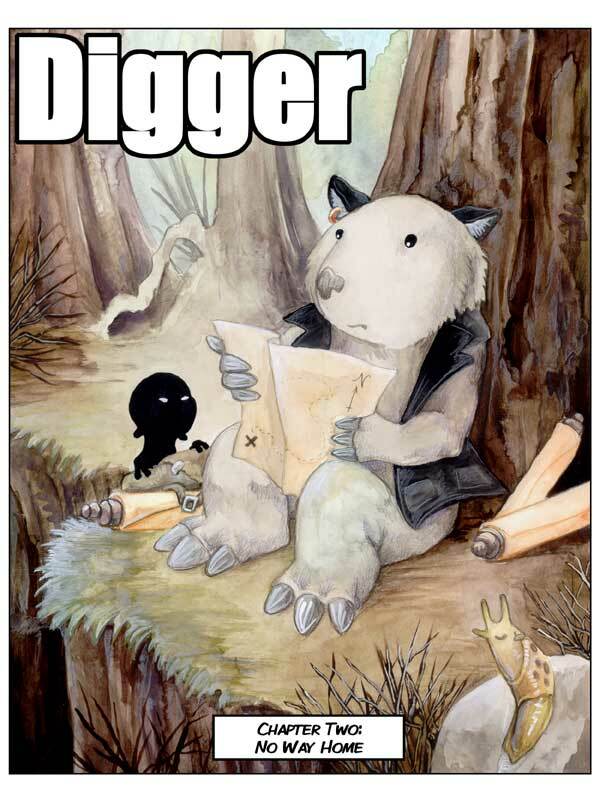 Digger herself is an eminently likable main character, full of common sense from her toe-claws to the tips of her furry ears, and she functions as a reader stand-in. Chatty and reflective in a down-to-earth way, her observations and opinions on everything from temple architecture to a village nurse’s medical practices make for a charming and often funny running commentary on the story’s world, serving to deepen the worldbuilding as well as develop her character. She, like all wombats, loves the art of engineering but distrusts things like magic (which the dwarves fiddle with too much) and religion (which, being wholly of the pagan and polytheistic kind in this story, is disorganized and full of dangerous or untrustworthy spirits). Now, at this point, I should probably tell you about some buried trauma of mine so that you’ll be willing to open up to me and tell me whatever. But frankly, I don’t have any buried traumas or dark secrets or anything. Well, I’m scared of ducks, but it’s really not the same thing. Her character feels consistent: she never denies that gods and magic exist, she just goes out of her way to avoid them whenever possible. When, at the story’s beginning, she finds herself lost and confused in a bewitched tunnel far from home and crawls out of a hole into a temple to the Indian god Ganesh, she is noticeably disappointed. And yet, because the spirit of the god’s statue can talk (it is careful to inform us that it is only the spirit of the statue representing Ganesh, not Ganesh himself), and can talk quite sensibly and courteously at that, Digger addresses it politely, even while honestly admitting her distaste for the supernatural. It is Ganesh—or the statue, rather, but Digger just gives up and conflates the two—who is responsible for kicking the plot proper off. He’s a fun personality, sometimes speaking grandiose words of prophecy, other times letting out an eloquently snarky comment, but always fairly humble and polite. The story’s cosmology is extremely vague, but seems to be loosely Hindu. After all, the character Ganesh is clearly a supernatural spirit who inhabits the statue. Yet he insists that he is not the actual Hindu god Ganesh, but merely the god’s representation in this particular temple. It doesn’t make much sense, but Ganesh himself admits it is confusing, and Digger is less concerned with pagan theology than with how Ganesh can help her get home. Ed: Of course It remembers! It remembers the rabbit It ate yesterday too, but rabbit still gone. Memory not life. The hyena Ed is perhaps the comic’s most fascinating and iconic character. Gentler than a puppy, more joyous and forgiving than a child, his outward appearance of simplicity betrays a mind and heart that have dealt with some of the most difficult issues, morally and emotionally, that it’s possible to imagine even in real life. The secrets of his story are revealed slowly, late in the comic, but prove crucial to Digger’s growth and understanding. I like Ed a lot – it’s almost impossible not to love him. I believe that a truly good character, well-portrayed, is inherently more interesting than a villain, and Ed is proof of this. For all the interesting flawed characters in this story, it is Ed, the kind and loving soul who made a heartbreakingly difficult choice based on his values, who may be Ursula Vernon’s greatest achievement. Murai: The Veiled serve the gods, Honored Digger. Comparative mythology and hand-to-hand combat are our specialities. Nothing is ordinary in this webcomic. The character who is the least fun is the girl Murai. She’s apprenticed to the Veiled monks who guard the temple of Ganesh and supposedly act as his police force, but have their own agenda. She’s another gentle soul whom Digger feels compelled to take care of, and then becomes surprisingly crucial to the quest. As a character, she’s okay, but because the Veiled are always, well, veiled, Murai can only express herself through her eyes, since we can’t see her mouth. While Vernon tries hard to make the character emote, Murai still comes off blander and less interesting than the others around her. The fact that she’s sometimes either insane or possessed by a prophetic spirit only makes it harder to figure out her own personality. Personally, I thought she got in the way more often than not, and I wish Vernon hadn’t made her so central to the later parts of the story. The artwork is always engaging, sometimes powerful. While I mentioned some of its weaknesses in the summary section, the truth is that Digger is still a joy to look at. Environments—particularly the forest—are well-evoked, and the level of detail is usually very pleasant and balanced. As vague as the setting is (vaguely Indian), it acquires specificity through all the little surprises Vernon adds to the corners and backgrounds of each page. Look at Ganesh’s library, pictured below. Little rats and mice nose around scrolls and books with titles like Ryleh Text and Chickens of the World II. Or this beautiful dark forest, where a trenchcoated and fedoraed lizard sidles into the bottom right corner, probably pondering the mystery of who killed his late partner or something. It has nothing to do with the plot, and this little guy doesn’t ever appear again. But it adds a welcome whimsy that’s not out of keeping with the weirdness of the world as a whole. Wombat ethics are pretty straightforward, and were not meant for situations this complicated unless geology is involved. 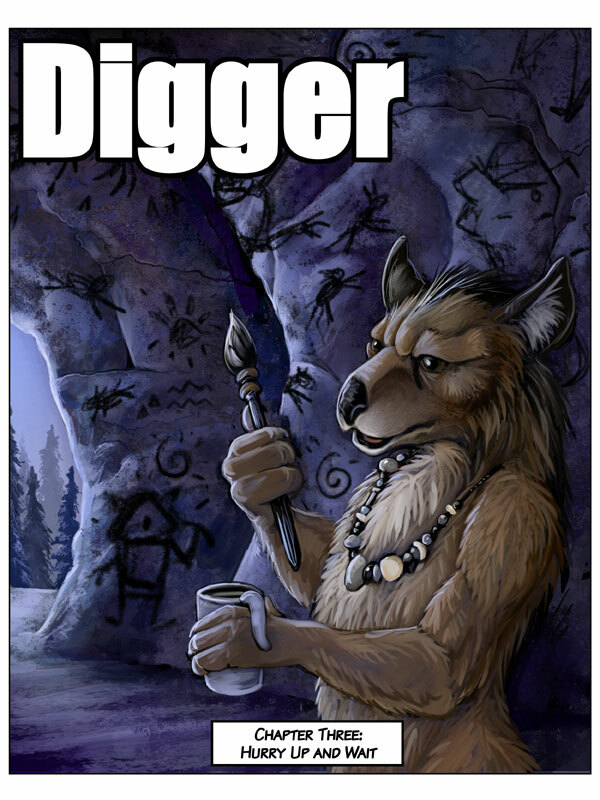 The characters, humor, and artwork are enough to make Digger excellent entertainment, but what gives it resonance are the discussions of morality and mythology that crop up more and more as the story progresses. The creature Shadowchild is so-named by Digger because he appears to be made out of shadow material, and has the demeanor and innocence of a child. He doesn’t know what he is or what morality is, so Digger finds herself having to explain to him what’s right and wrong. This proves difficult. As a Christian, I found these segments interesting because even though I know what the absolute standard for truth and morality is, Digger (and presumably Ursula Vernon) takes a loosely agnostic stance on theology (not denying the existence of gods, but rather their relevancy and utility), but finds herself trying to defend what her conscience tells her are universal truths. She does a pretty good job; while obviously insufficient from the standpoint of Christian knowledge, her explanations avoid complete relativism and do illustrate the difficulty of articulating deeply-held beliefs. Other times, Digger herself is directly faced with thorny moral quandaries. The most prominent and interesting one I cannot, unfortunately, tell you, for fear of spoiling important plot points, but it involves Digger’s need and desire to take part in a tribal ritual that—very contrary to her desire and morals—involves a kind of cannibalism of the dead as a way of honoring them. It was a case where I would still say that the tribal culture is wrong, but Digger’s choice was likely made for righteous reasons and, in context, may have been morally acceptable. But it’s a tricky case, and undoubtedly one that has come up for real-life Christian missionaries before. I’m glad that Vernon is able to ask questions like this in her story. More troublesome is a section where one character relates a myth—possibly true within the comic’s world—that quite overtly echoes the Christ story in certain key elements. It begins on page 366. It calls the Christ figure the Good Man who was revered as a god, who was born miraculously by his mysterious mother who was revered as a goddess, and he healed the sick, raised the dead, and converted politicians (to which Digger cries out “Now I know this is a myth!”) until one day he was attacked and mortally wounded by the families and friends of the people he hadn’t cured and raised from the dead. He is carried by his goddess-mother back across the sea over which she had originally come, and never seen again. There is no talk of sin, grace, redemption, or any kind of salvation, but there is a promise to return. The story is powerfully told through Vernon’s artwork, but in the context of the whole webcomic it doesn’t end up amounting to much. It helps explain just one minor plot point and never shows up again. The elements that resemble the Christian gospel feel forced to do so, and contrast oddly with the parts that are clearly un-Christian. I’m not entirely sure what to make of it. If this were presumed to be a retelling of the actual Christian gospel—as Catherynne Valente tries to do in Habitation of the Blessed—it would be easier to see this as blasphemy and a perversion of the gospel. But Vernon doesn’t make that claim, and is rather just telling a myth she made up for her fantasy series That story, however, goes out of its way to use Christian imagery and language. She doesn’t seem to be critiquing actual Christianity, but it left me feeling rather uncomfortable, for she did co-opt the story of my Lord to tell another one that is untrue and much less meaningful. Likewise leaving me uncomfortable is the great quest—the main plot arc—which involves killing a god (possibly two). Again, these are definitively pagan gods, weaker even in Vernon’s world than those of Greek, Norse, or Egyptian mythology, but it still reflects an idea of divinity which is increasingly common in our time, that of any idea of divinity as pathetic and weak, unworthy of reverence, and able to be conquered and killed by man. The god Ganesh is the only positive portrayal of divinity, and even then it’s only his statue who appears, and he’s hardly powerful, just knowledgeable and wise. As a Christian and an amateur classicist, I cannot be offended by the negative portrayal of deities which are explicitly very far from the true God I know. But as a Christian and a person aware of the prevailing trends in popular and academic culture, I am still worried that this is one more work that denigrates the idea of the supernatural, to the elevation of the created over their Creator. It’s a good comic here, a good story, but not without elements a Christian might object to. So there you have it – a very long review in which I probably left out a great many important things from the comic. To re-iterate, most of the comic is really very funny. The oracular slug is hilarious, as is Surka the shrew who is also a professional troll (and sometimes professional pirate queen, and even the possibly-demonic morally-confused Shadowchild is a great source of comedy. Digger’s internal voice is a delight to read, what with her wry comments on the weirdness about her, and Ed is so cuddly you just want to hug him and give him a cup of tea. But there is some serious stuff going on to balance out the laughs, and the main plot is of a quite dark nature. Who’d have thought a slug could be so…cute?